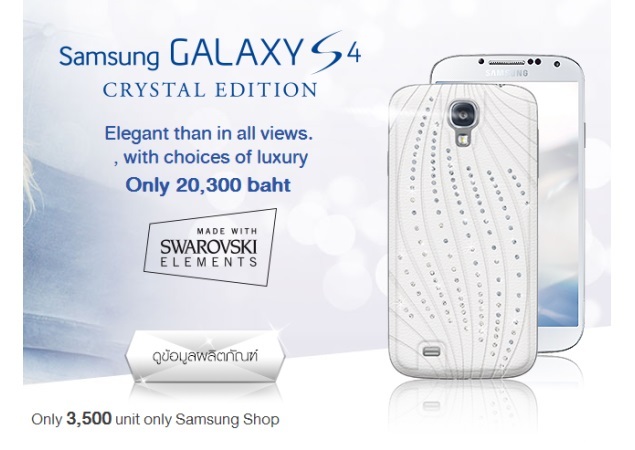 Samsung has released yet another new smartphone to market, this time known as Galaxy S4 Crystal Edition. The new company product comes in a white chassis that offers a large number of Swarovski crystals incrusted in the chassis in various forms. As expected the new smartphone targers wealthy women. The Galaxy S4 Crystal Edition comes with a relatively large 5-inch display that works at Full HD resolution (1920 x 1080 pixels, 441 ppi) and has an eight-core Exynos 5 Octa processor, 2 GB of RAM, 16/32/64 GB of internal storage, a microSD card slot, a 13 MP rear camera, a 2600 mAh battery and a S Pen stylus. The device runs Android 4.2 Jelly Bean. Interested? Then Samsung has some bad news for you. The new smartphone is only available on the Taiwanese market and even then there will be just 3500 smartphones of this kind. Still if you happen to visit Taiwan in the next few weeks you might be able to find this device – it costs USD 630.